Our Bodacious Botanical Lip Gloss™ smoothly glides over your lips creating a perfectly moist, soft look. Now cowgirls don’t have an excuse for weathered-chapped lips. Bodacious Botanical Lip Gloss™ will provide you with an ideal everyday look, and top off any date night look with a little added shine. Sample Size good for 1-3 uses. I got Middleton Passion and Lil Pink to try. I'm relatively fair skinned with olive undertones and the Middleton Passion was a pretty, dark rose tone with some shimmer to it. I'm not a fan of shimmer but it looked pretty good - I give it a 4. Lil Pink has a pearly white sheen to it that seems very 90s to me - pretty, but artificial looking. I was hoping for more of a sheer gloss with pink tones. My husband loved it, though, so I'll compromise by giving it a solid 4. :) Both glosses feel and smell very good. I tried Barn because I was looking for something orange-toned, and it is more brown than orange, and I think it would look much better on super warm-toned women. It smells good and tastes good, doesn't cause dry or blistered skin. It is true that it doesn't last more than four hours, but that doesn't really bother me. If I could find the color I liked, this would be a great product for me. Fun color; easy to apply. Lasts for several hours. I like this gloss, feels really nice and creamy. This shade is too light, next time I will order a darker shade. I love the way this lip gloss feels on my lips, the texture is great, but I had a hard time finding a color that I liked. I ordered a few samples but wasn't in love with them. I was looking for something more glossy-clear with a hint of color and these seem to be a bit heavier in color than I was looking for. I would absolutely love these if I found a color that I liked. I recently ordered some samples (Lil' Pink &, and Cowbell lip gloss; Flicka lip stick; lip moisturizer; and body butter) I have tried the Lil' Pink lip gloss, the lip moisturizer, and the body butter and I am in LOVE with all of it. The best part it came in the mail more quickly than I was expecting!! I would definitely order these products and more again from Cowgirl Dirt! Samples are such a great idea! I could hardly decide which to get in the regular size so, I got a couple samples. My favorites for my dark skin tone was Country Peach (for a more casual look) and Barn )for a more fancy look). These lip glosses have a great texture, great smell, and they stay on forever! THANK YOU! I just love that Cowgirl Dirt has the option for samples! It can be so hard to tell if a makeup color is right for you when shopping online. I got the Barn color (brown hair, green eyes, very fair skin) and it is the perfect berry tone I was looking for. It goes on very smoothly, smells good, and it looks like this little sample will last me a couple weeks. I'll be ordering the full-size version soon! Coat your lips in the rich and flavorful natural ingredients in our Bodacious Botanical Lip Gloss™. Organic Coconut Oil: This antimicrobial oil rejuvenates your lips by softening and moisturizing it. Certified Organic Green Tea Extract: This extract is an antioxidant rich with vitamin C.
Natural Stevia Leaf Extract: This natural sweetener provides a great flavor to our lipglosses, making them enjoyable to use. Certified Organic Ricinus Communis (Castor) Seed Oil, Certified Organic Cera Alba (Beeswax), Organic Cocos Nucifera (Coconut) Oil, Ricinus Communis (Castor) Wax, Natural Stevia Rebaudiana (Stevia) Extract, Certified Organic Camellia Sinensis Leaf Extract (Green Tea) Extract, Non-GMO Natural Vitamin E Oil, Certified Organic Rosmarinus Officinalis (Rosemary) Leaf Extract, Certified Organic Punica Granatum (Pomegranate) Extract (+/- Mica, Certified Organic Citrus Aurantium Dulcis (Orange) Peel Oil (Sweet Orange) Essential Oil, Certified Organic Rubus Idaeus (Raspberry) Extract, Certified Organic Mentha Piperita (Peppermint) Oil, Certified Organic Mentha Viridis (Spearmint) Leaf Oil Certified Organic Vanilla Planifolia Fruit (Vanilla) Extract). 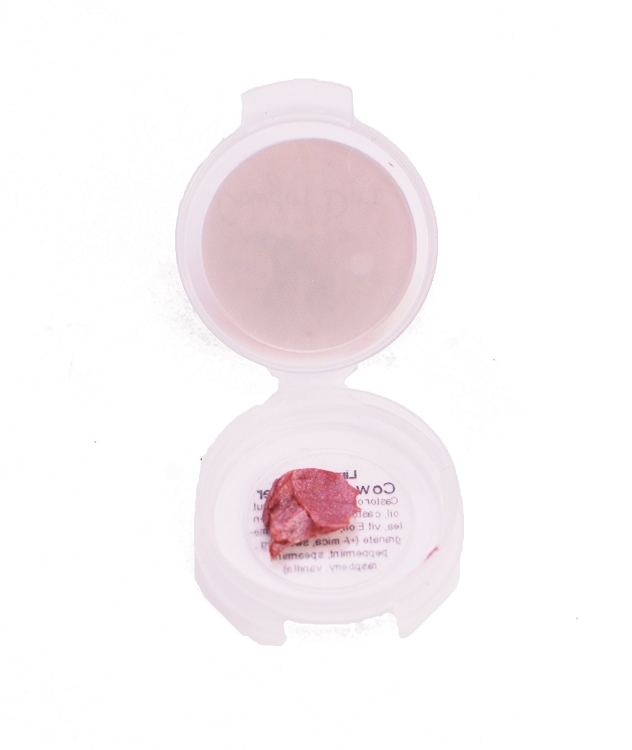 *Note: The Udderly Mauve shade contains a small amount of Carmine for natural coloring. 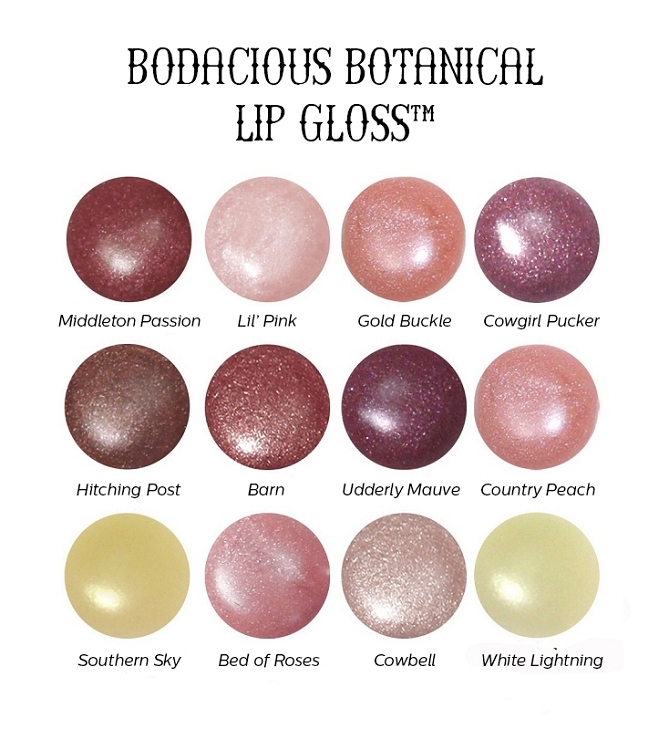 Bodacious Botanical Lip Glosses provide a seamless, shiny gloss finish to any lip look. For the best lip look, start with the High Noon Lip Moisturizer™ to lock in moisture all day. Next follow up with a Yeehaw Lipstick™ to give your lips an all day color. Finish with the perfect gloss look with Bodacious Botanical Lip Gloss™. 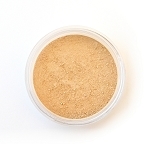 For perfect pairings try Cowgirl Dirt's Pucker It Up Collections. To complete any lip look without the guess work of color matching, finish off with our clear lip glosses: Southern Sky and White Lightning. Southern Sky has an orange, vanilla flavor and White Lightning is flavored with mint. While choosing a lipstick color mostly has to do with preference, some guidelines will help you know which colors are sure to look great with your complexion. First, you need to know your skin tone--cool, warm, or neutral.